These five days will be filled with prizes and activities all built to engage and empower your little ones, while they learn new skills and ways to express themselves. it is the perfect creative Kids Camp you have been searching for! 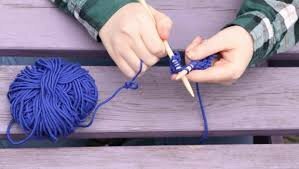 Activities may include: finger crocheting and knitting, Kool-Aid wool dying, weaving, loom knitting and learning how wool goes from sheep to yarn. Instructor Bio: CJ Durbin is an avid crafter, enjoying knitting and crocheting as well as sewing and jewelry making. She has been knitting for 13 years and crocheting for over 10. CJ has taught 1st -5th grade over the past 24 years and enjoys bringing her love of yarn into the classroom each year. Weaving, finger crocheting and Kumihimo (Japanese braiding) are some of the projects her class learns each year. Her delight is teaching and sharing her love of yarn with her young students in engaging ways, so they will become life long crafters themselves. She looks forward to having a fun week of exploring creative yarn activities and skills.